As its name hints at, Aberdeen Standard Investment’s Edinburgh Dragon Trust (EFM) invests in Asian stocks. This has meant that over the past year it has suffered various ups and downs as trade war fears have buffeted the region’s markets. 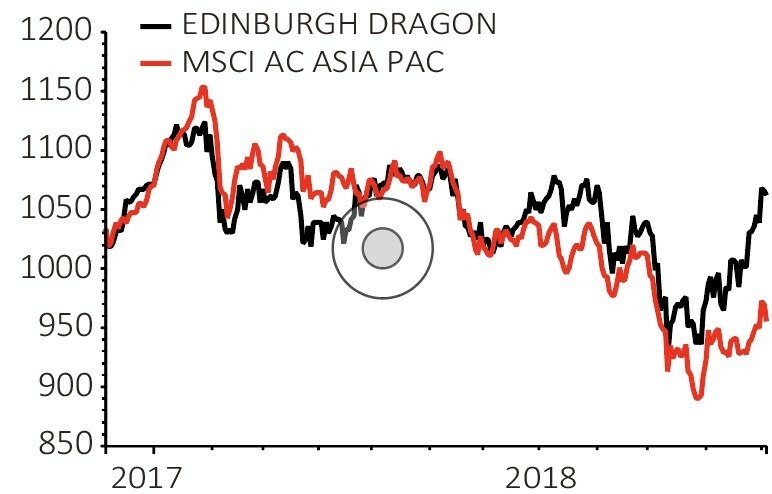 Despite an increase in volatility however, shares in the trust are more or less flat year-to-date in sterling terms at 368p while the MSCI Asia ex-Japan index is down 13% for the year. As of the end of October shares in the trust were trading at an 11% discount to the underlying net asset value (NAV) of its investments of 413p per share. 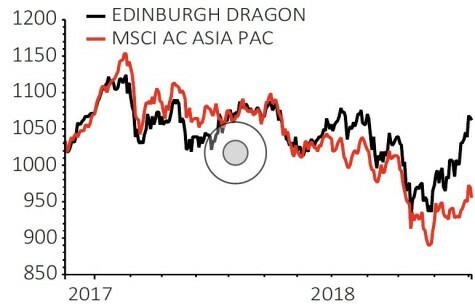 Performance has been mixed and on a cumulative basis the trust is up 30.6% in share price terms over five years, against a 50.2% advance for its MSCI AC Asia ex Japan index. This is largely because the trust has avoided some of the growth stories in the Asian technology space. It should be noted that as well as avoiding Japan, the trust (like its benchmark) steers clear of stocks in Australia, New Zealand and Sri Lanka. When selecting stocks, manager Adrian Lim puts a great deal of emphasis on the strength of a company’s business model, the quality of its accounts and its corporate governance record. This means that he tends to buy stakes in established names rather than ‘the latest thing’ which may or may not prove to be a sustainable business. It also means that if a company meets the trust’s quality criteria he is happy to pay a fair price rather than try to time the investment and buy more cheaply because in doing so he risks missing out if the stock rallies instead. The two biggest sectors in the Asia ex-Japan index are technology (30%) and financials (24%) but Lim favours the latter over the former. While the trust counts chip-maker Taiwan Semiconductor and tech giant Samsung Electronics among its top holdings, it has a larger spread of financial stocks ranging from Hong Kong insurance firm AIA Group to India’s Housing Development Finance Corp (HDFC) and Indonesia’s Bank Central Asia. Asia’s middle class is currently estimated at 525m people or less than a third of the world’s total but over the next decade more than a billion more people are expected to join their ranks. One school of thought is that catering for the financial needs of a rapidly-expanding and increasingly wealthy middle class will result in plenty of potential upside for local banks and insurers. Lim, who is based in Singapore and has jointly run the fund since 2007, is positive on Chinese stocks but avoids those which might be impacted by US tariffs. The fund’s second-biggest holding is Tencent which operates online and mobile games, online messaging and apps for the Chinese market. The fund also owns local hotel chain Huazhu which is benefiting from a strong and steady increase in tourism within China, and Kweichow Moutai which makes a premium version of the distilled Chinese liquor baijiu. Having run the fund for more than a decade Lim has seen Asian stocks come in and out of favour with investors and he takes a long-term ‘through the cycle’ view. Stocks such as Samsung Electronics, Tencent and HDFC have been in the portfolio for many years and all have experienced large sell-offs this year. Tencent owns some of the biggest video game franchises in the world and its shares more than doubled last year as investors chased growth stocks. 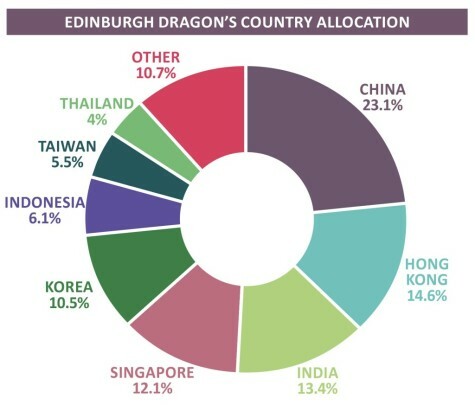 However a less favourable attitude towards gaming by the Chinese authorities this year saw the shares fall from a high of HK$470 in April to a low of HK$260 last month. Lim notes the upcoming listing of its music subsidiary as evidence of its ability to create value. Tencent Music Entertainment runs the four leading mobile music apps in China with 800m monthly active users and reported a 240% increase in profit for the first nine months of the year. The listing is expected to value the company at over $1bn. Another long-term holding to have suffered a setback recently is Indian mortgage lender HDFC, which is a core shareholder in infrastructure group IL&FS. Over the summer IL&FS failed to make payments on some of its loans sparking panic that it was in financial difficulty. According to India’s Economic Times, IL&FS’s debts amount to an astonishing 18 times its market value and after it defaulted the company’s credit rating was cut making it more expensive to roll over its loans. This means that shareholders including HDFC and the Indian government face pumping more money into the company or selling their stakes at a big loss. Lim admits that until the default no-one had IL&FS on their radar as a risk but he is confident that HDFC can weather the storm and in fact its shares have already recovered most of the ground they lost this summer. These episodes show that even with a portfolio of rigorously-chosen, high-quality stocks, investing in Asia needs steady nerves and a long-term view.